One of the more notable masters of photography was Minor White. Our earliest introduction was to a folio of his New England barn photographs that underlined his “spiritual” approach to image making. What lent a special aura to this work was the use of infrared film. A new generation, now using digital tools, has come on the scene. 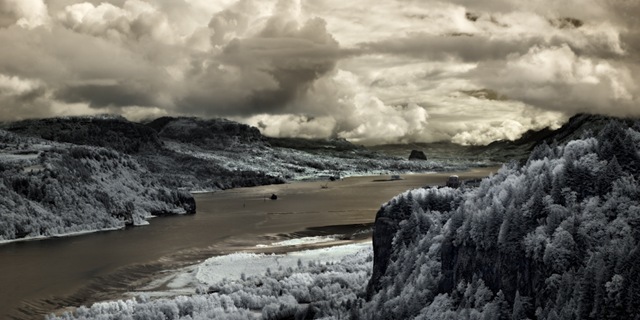 An artist with a great talent using IR imagery is John Custodio. 1. What are you trying to accomplish with your IR images? To give the viewer a different viewpoint as seen through the infrared spectrum. 2. IR photographs have a long, varied history but many tend to have a "flatter" appearance than normal Black and White. How do you achieve your range and depth of tonality? Since all my "darkroom" work is in Photoshop, I have complete control of how the image looks, so I can adjust contrast both globally and locally. Also, many of my IR images rely on the "false color" effect exhibited by digital sensors exposed to IR. I’m not working with a totally neutral grayscale, but with a toned palette that ranges from blue-yellow to red-magenta (depending on how I convert the raw file in the raw converter). 3. What attracts you to “Black and White” as a medium for expression? Its graphic quality and simplicity. But my current work is divided into 3 categories – Full color: If the color in an image is what defines it; Black and White: Again for its graphic quality and simplicity or If color would be uninteresting or a distraction; and most of my IR work: Neither full color nor black and white (a toned palette as described above). 4. Any specific technical tactics you employ that are keys to success in any of your images? I would say the entire process I use in Photoshop. But specifically, how the file is converted in the raw converter determines the color palette of the final image. Also I use diffusion a lot, it softens hard edges and gives the image an ethereal glow. 5. You converted a Canon 5D to IR? … an "expensive" camera. What was your thought process on taking that path? Since a good portion of what I shoot is infrared, and since I usually like to print up to 16×20, I didn’t want to use a lesser quality camera, the 5D being a full-frame 12.8 megapixel camera.